If there's any single Olympic sport in which the United States is most expected to win — nay, must win — it's Olympic basketball. With America standing as the dominant power of the hoops world, and a pair of star-studded Olympic teams currently competing in Rio, it's not just winning that's expected, but dominance, too. And so far, one of the two American teams has been seriously outshining the other: the USA women's basketball team has been more dominant than the men throughout this Olympic run, and it really hasn't been close. Sure, the American swimming and gymnastics teams have put on a real show in Rio this time around, but those kinds of events will never feel quite so assured. All the talent in the world can still come up short when one tiny miscue is all it takes, and when your performance is rated by a judge rather than a cold, impartial scoreboard. In basketball, the games are long (40 minutes in total divided into ten-minute quarters), and forgiving to an occasional lapse or error. In other words, with more time and more chance to make up for past mistakes, the more talented team is even more likely to win out. And to throughout the qualifying rounds in Rio, the women's team has been dominating the field in a way that the men's team — which would surely be the greatest NBA team of all time if they ever played together — hasn't been able to match. There's no simpler, easier way to determine how dominant a team is relative to its competition than point differential — in other words, it's not just how many wins you have, but how many points you're winning by. And in that regard, the U.S. women have been tearing a hellacious path through every opponent that's stood in front of them. So far, the American women have faced off against four different teams from around the world, and their record stands at a perfect 4-0. They opened up the tournament by beating Senegal by a staggering margin of 121-56, for a +65 point differential. They then beat Spain by a final score of 103-63, good for a +40 point differential. Next they toppled the Serbian team, 110-84, for a +26 point differential. And finally, they most recently dispatched Canada, by a final score of 81-51, for a +30 point differential. 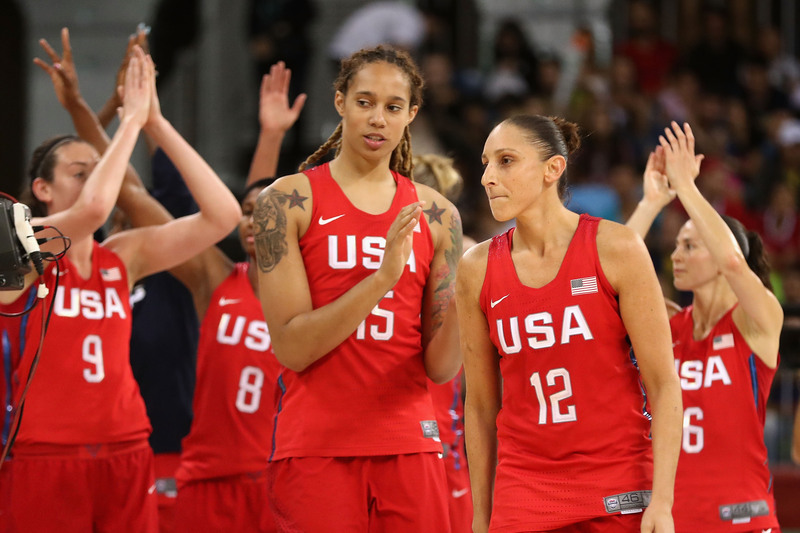 Total that all up, and the American women are beating their opponents by an average of 40.25 points per game, led by superstars Brittney Griner and Diana Taurasi. In case you don't follow basketball, that's an absolutely mind-blowing average margin of victory. And notably, it's a standard that the USA men's basketball team has fallen short of in Rio so far. While the women haven't really encountered a moment when one of their games was in serious doubt, the men have had a couple of close calls already. They've also played four games, and while two were epic blowouts, their most recent two (relative to the team's staggering talents) ended up being bizarrely close. They beat China by 57 and Venezuela by 44 to open the tournament, but they actually trailed Australia at halftime before winning by 12. And then, most recently, they barely edged out the Serbian men's team, by a mere three points. On the whole, while they've still won all four games, their average margin of victory has been 29 points per game — still otherworldly, but a hollow imitation of the kind of routs the women have been putting on. Of course, the basketball tournament is still in its qualifier rounds, so the competition is likely to pick up as the field narrows. If you're interested in watching the women's team try to further its incredibly dominant run, you're in luck — they'll be playing again on Sunday, August 14th, facing off against Team France at 1:15 p.m. ET.